Fishing charters on Siesta Key are popular among visiting anglers. Many vacationers are attracted to the powdery white sand beaches. However, the waters around Siesta Key offer anglers a wide variety of fishing options and species. Siesta Key is a barrier island on the West Coast of Florida in Sarasota. It lies about an hour south of Tampa. The beaches are world-class, as are the restaurants and resorts. Siesta Key is surrounded by the Gulf of Mexico, Sarasota Bay, Roberts Bay, and Little Sarasota Bay. All of these waters offer visiting anglers a diverse fishing experience. 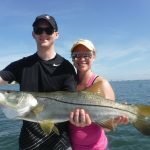 Anglers going out on fishing charters on Siesta Key maximize this experience by going out with a license, experienced, professional fishing guide. Visitors do not need a great deal of angling experience in order to be successful. Many of the fish are caught by drifting open waters, were great casting skill is not required. Spinning tackle is used on almost all fishing charters on Siesta Key. It is versatile and easy to learn to use. Both live bait and artificial lures are used, depending on the experience and skill level of the clients. Seasoned anglers may choose to target more challenging species. 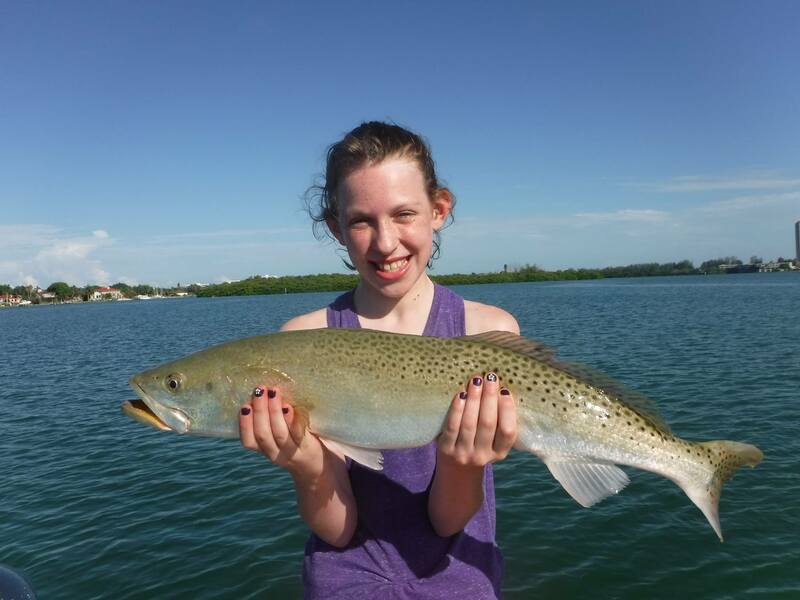 The species of fish that is available to anglers on fishing charters on Siesta Key is long. 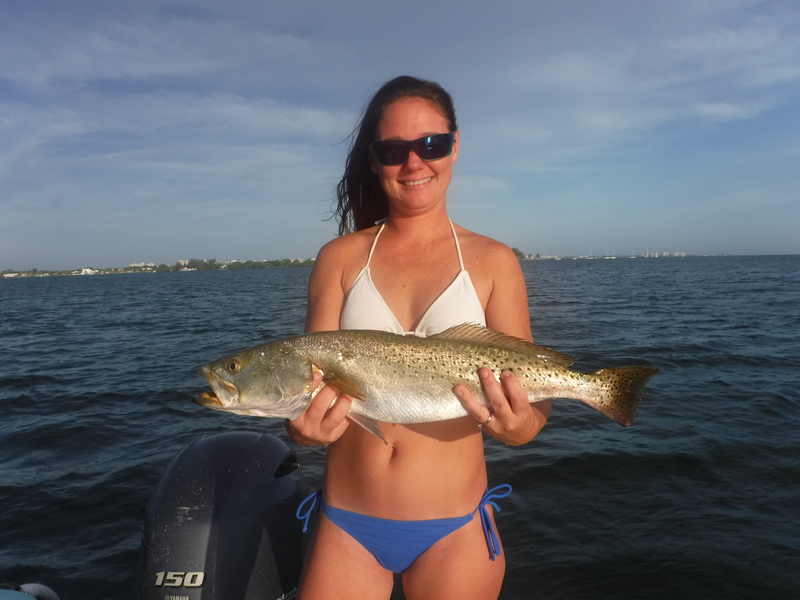 The inshore bays and passes produce speckled trout, pompano, snook, redfish, jacks, mangrove snapper, gag grouper, sheepshead, flounder, ladyfish, bluefish, black drum, cobia, sharks, catfish, and more. Anglers fishing in the inshore Gulf of Mexico may encounter false albacore, tarpon, Spanish mackerel, king mackerel, and sharks. Anglers can check the FWC website for current Florida fishing regulations. There are distinct fishing seasons in Florida. The time of year will dictate the techniques used and to some degree the species that will be caught. That is another satisfying aspect of fishing charters on Siesta Key. Anglers visiting during different times of the year may have completely different experiences. Let’s run through the four seasons outlining the techniques used and species that are most often caught. Winter is a relative term. Despite the fact that it is usually much warmer in Sarasota, Florida than most of the country and winter, fish do change their habits this time of year. The water temperature on the flats is often quite cool. This will result and fish species moving off of the flats in search of deeper water. Residential canals, creeks, deeper holes, and the passes are all prime spots to search for fish and winter. Big Sarasota Pass lies on the north end of Siesta Key. It connects Sarasota Bay with the Gulf of Mexico. Fish use the pass as a migration route to go back and forth from the Gulf to the Bay. Structure in the pass holds sheepshead and snapper in the winter. Sheepshead are a structure oriented bottom fish that school up heavily in the winter. They spawn in the rocks this time of year. Sheepshead and snapper are caught by anglers bottom fishing with live or frozen shrimp. 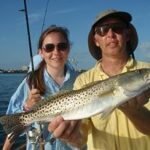 Speckled trout and ladyfish will school up in the deeper holes and channels in the winter. The Intracoastal Waterway will often hold fish, especially on the lower tide stages. Deeper cuts and channels along Bird Key and behind Siesta Key will hold fish as well. A live shrimp free lined with a split shot works well, as does a lead head jig and grub. Anglers fishing live shrimp under docks on fishing charters on Siesta Key will do well on sheepshead, black drum, redfish, and snook. 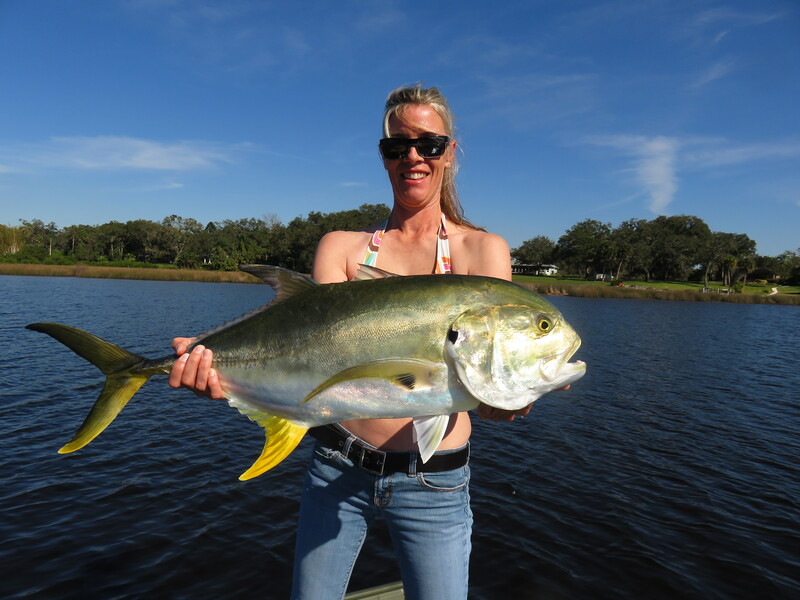 Snook and jack crevalle will migrate up into residential canals and creeks in the winter. The Grand Canal on Siesta Key is a prime example of this. Phillippi Creek is another great spot to target these species in the winter. The best approach is to drift with the tide while casting artificial lures such as shallow diving plugs and jigs to shoreline cover and structure. Spring can be a great time to be fishing on Siesta Key. Warming water temperatures will have fish moving out of the deeper water in onto the flats to feed. Submerged grass beds in water between 5 feet deep and 10 feet deep will hold a variety of species. Anglers drifting the flats and casting live shrimp or jigs can expect to catch speckled trout, Spanish mackerel, pompano, ladyfish, bluefish, and more. Big Sarasota pass is usually very productive in spring time as well. The sheepshead run will be winding down, however Spanish mackerel numbers will be on the rise. Anglers drifting the center of the pass and sandbars will catch mackerel, pompano, ladyfish, bluefish, and more. Ladyfish will often times school up in large numbers. This is a great opportunity for inexperienced anglers to catch a lot a fish in a short amount of time. Experienced anglers seeking a bit more challenge may choose to target the shallow back water areas for snook, redfish, and jacks. Shallow diving plugs and jigs are cast towards mangrove shorelines, oyster bars, docks, and other fish holding structure. This type of fishing will produce less in terms of numbers. However, it generally produces more in terms of quality. That means bigger fish! The inshore Gulf of Mexico can come alive in the spring. 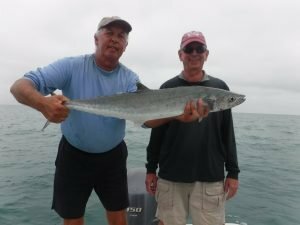 When conditions are right, Spanish mackerel, king mackerel, false albacore, and sharks will be plentiful quite close to shore. East winds will result in calm, clear water in the Gulf of Mexico. Huge schools of bait fish will move in, with the predator fish caught on their tail. The action can be nothing short of spectacular as fish are seen feeding voraciously on the surface. Summer fishing can be fantastic, though it is also awfully hot. Anglers need to be out on the water at first light and are usually done by 11:00 AM or so. Small bait fish flood the flats near the passes and summer. This bait attracts the game fish. One extremely effective technique used on fishing charters on Siesta Key is live bait chumming on the deeper grass flats. This technique involves catching many of these little fish and then using them to attract other fish behind the boat. It is a deadly technique that produces 100 fish days occasionally. It is also very easy for anglers with little experience to use. The boat is anchored up in 6 foot of water to 8 foot of water and then handfuls of the live bait fish are tossed out behind the boat. It usually doesn’t take long before game fish are feeding 10 to 15 feet behind the boat. Speckled trout, mackerel, ladyfish, snapper, grouper, sharks, bluefish, and more are often landed by clients. Snook have migrated out from the bays and are in Big Sarasota pass and out on the Siesta Key beaches. This is a great time to target these game fish as they are schooled up in good numbers in the deep structure at the northwest corner of Siesta Key. Anglers also sight fish for them right off of the beaches along the entire length of Siesta Key. Our largest fish of the year are also targeted by anglers fishing in the summer. Giant tarpon show up in the Gulf of Mexico off of the Siesta Key beaches in early May. They school up in large numbers as part of their annual spawning migration. These fish are seen milling about on the surface and anglers cast to them using live baits such as crabs and sardines. This is big-game fishing in every sense of the word as these fish average 80 pounds and fish to 150 pounds are not uncommon. Tarpon fishing does require patience and not every trip will produce fish. Fall is a fantastic time to experience fishing charters on Siesta Key! The weather is usually fantastic, with low humidity and little rain. It is also the time of year that has the least amount of tourist traffic. This results in less boating activity and thus less fishing pressure. Cooling temperatures have the fish energetic and in a mood to feed as a transition to their fall locations. Action on the deep grass flats is very good in the fall. Anglers drifting the flats will cast lead head jigs and live shrimp in search of speckled trout, Spanish mackerel, pompano, bluefish, ladyfish, and other species. Large areas of grass that are in water between 5 feet deep and 10 feet deep are usually the best spots to try. Snook fishing is usually very good in the fall as well. Fish have moved off of the beaches and passes and into the backwater areas on the east side of Siesta Key. This area of Little Sarasota Bay and Roberts Bay is prime snook and redfish habitat. Mangrove shorelines and oyster bars are plentiful. The key is finding spots with a little bit of water depth, between 2 feet and 4 feet deep. Anglers chumming with larger live baits or working the shorelines and casting lures will do well. Fall action in the inshore Gulf of Mexico is often times better than spring. The main reason for this is that the weather patterns are more stable. This results in optimum conditions being present on more days. Days of high pressure will result in Northeast winds which will have the waters close to shore, in clear. False albacore in particular are more plentiful in the fall. 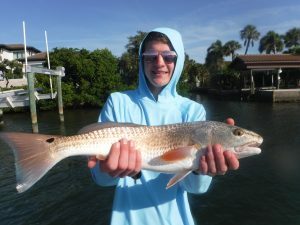 One one enjoyable aspect of taking out fishing charters on Siesta Key is the variety of fishing techniques that are used. Anglers seeking action and variety will do well to drift the deep grass flats in Sarasota Bay. 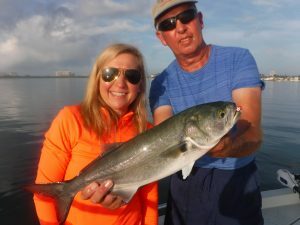 Big Sarasota pass offers clients to chance to vertically jig for pompano, ladyfish, and other species. Bottom fishing with live shrimp around structure such as rocks, bridges, and docks produces sheepshead, mangrove snapper, grouper, drum, snook, redfish, and flounder. Experienced anglers working the shallow water oyster bars and shorelines may catch a trophy snook, redfish, or Jack. Fishing the inshore Gulf of Mexico can be fantastic when conditions are right. Drifting the deep grass flats in Sarasota Bay is a very productive technique. These are fairly large expanses of submerged vegetation and water between 5 feet deep and 10 feet deep. Bait fish, shrimp, and other crustaceans seek refuge in the grass. This in turn attracts game fish. The grass provides cover and ambush points for them as well. 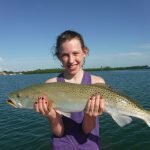 Speckled trout, bluefish, Spanish mackerel, pompano, snapper, grouper, ladyfish, sharks, cobia, catfish, and more are taken on the deep grass flats near Siesta Key. Drifting is often the best technique to employ when fishing the deep grass flats. The fish can be scattered over a wide area. Drifting with the wind and tide while casting artificial lures or live bait is an extremely productive method. Once fish are located, the boat can be anchored in the area fist thoroughly. Often times the drift is just continued and then the boat idled around so that the same area can be drifted again. Chumming with live bait is an extremely effective in the warmer months. Large schools of small to inch to 3 inch bait fish are generally fairly easy to locate and catch when the water temperature is in the mid-70s or higher. Once the bait is obtained, the boat is anchored on a likely flat and handfuls of the live bait are tossed out behind the boat as chum. It usually does not take long before fish are taking advantage of the free meal. It seems like a contradiction, but often times the largest fish are found in shallow water. These larger fish are quite often loners and are not found in schools as the smaller fish are. The exception to this is in the late summer when redfish school up into larger numbers on the shallow flats. This type of fishing is more challenging. 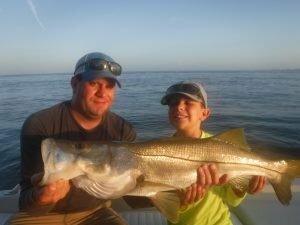 It takes patience and some casting skill to thoroughly cover the flats, mangrove shorelines, and oyster bars where snook, redfish, and jacks are found. Artificial lures work very well in this application. They allow anglers to cover much more water than can be done with live bait. Game fish can be scattered out over quite a large area. Lures that draw strike such as shallow diving plugs and soft plastic baits along with weedless gold spoons are all excellent search baits to help locate the fish. Chumming with live bait can be just as effective in the shallow water as it is on the deeper flats. The only difference is that slightly larger baits are preferred to attract snook, jacks, and redfish. The technique is the same though, the boat is anchored close to a likely shoreline and a few live baits are tossed out to attract the game fish. Once the snuck start popping on the free baits, there fairly easy to catch on the hook. This pass runs between Siesta Key and Lido Key. It can offer good fishing all year long on a variety of species. 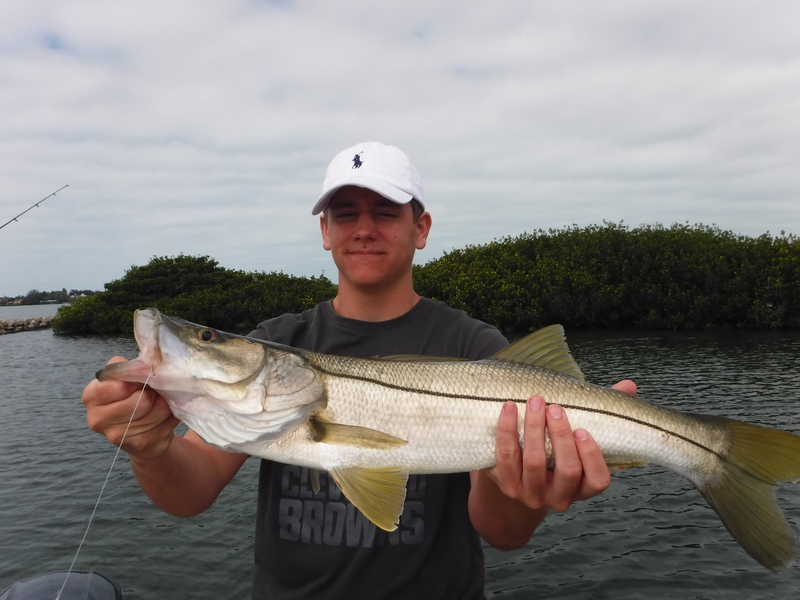 Snook will school up heavily in the rocks at the northern part of Siesta Key in the summer. Sheepshead are found in the same areas in the winter. Mangrove snapper can be caught in the structure all season long. 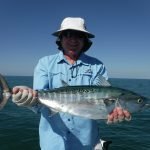 Spanish mackerel, ladyfish, bluefish, and pompano will be found in the open waters of the pass and along the Scholl areas as well. Often times, Spanish mackerel can be seen busting on the surface. This is great fun and very exciting as almost any lore or bait that gets cast towards them will draw a strike. Vertically jigging while drifting with the tide will also produce the same species on the bottom. Bottom fishing is a simple technique that is been around for a very long time. It basically consists of hooking on a live or fresh dead bait and dropping it to the bottom. The majority of fish species feed on the bottom, especially around structure. The water surrounding Siesta Key have countless docks that hold fish. Other fish holding structure would include bridges, seawalls, rocky ledges, and even oyster bars. The best bottom fishing bait for anglers on fishing charters and Siesta Key is live shrimp. It is readily available at all local bait shops all year long. Every fish that swims in this area can be caught on a live shrimp. Fresh dead shrimp will work as well, particularly on sheepshead and drum. Live bait fish will not normally catch as many fish as shrimp will, but will often times catch larger specimens. 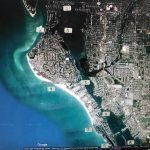 The waters in the inshore Gulf of Mexico just off of the Siesta Key beaches can provide visiting anglers with world-class fishing when conditions are right. East wind will result in calm, clear water close to shore. In the spring and again in the fall, this will attract huge schools of baitfish such as scaled sardines, glass minnows, and threadfin herring. These huge schools of bait fish will attract Spanish mackerel, king mackerel, false albacore, sharks, cobia, and even tarpon. Often times, the fish can be seen visually feeding on the surface. This is known locally as “breaking fish”and is one of the most exciting experiences an angler can have. Game fish will literally have the water boiling as a frantically devour every bait fish that they can. This is a great opportunity to use artificial lures. Heavier lures such as spoons can be cast a long way and there erratic flash and vibration almost always draws a strike from feeding fish. Jigs and plugs can also be effective. In reality, just about any lure that remotely resembles the baitfish that they are feeding on will catch fish. This is an excellent opportunity for fly anglers to score as well. In conclusion, I hope anglers enjoyed this article about fishing charters on Siesta Key, and that it will encourage them to give it a try! 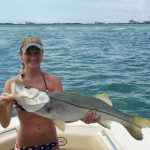 Summer snook fishing in Sarasota! Fantastic false albacore fishing in Sarasota!